Casey will serve as a liaison between Tribes in the Northeast and the Southeast, the United south and Eastern Tribes Inc. (USET), the Bureau of Indian Affairs, and climate science researchers to provide current climate science information, to identify climate research needs and priorities, and to provide climate adaptation planning support. Casey is a Mashpee Wampanoag Tribal member with an educational background in climate science. 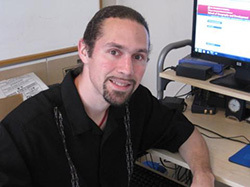 His PhD research focused on investigating climate teleconnections and North American precipitation.